Are you thinking about buying a raw fleece? All the choices can be a little overwhelming at first. But don’t worry, I’ve put together some tips to help you pick a fleece with confidence and find one that you will love working with. 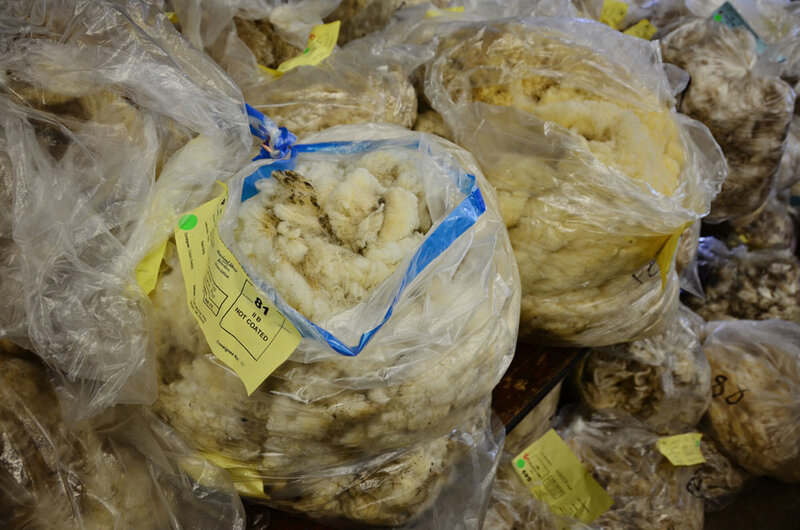 There are several factors that go into evaluating a fleece. There’s a bit of an art and science to it. You may not get it 100% “right” at first, but that is how you learn. Understanding what to look for and what you want ahead of time will help you avoid buyer’s remorse. Festivals are a great place to start because you can see a variety of fleece and compare easily. They usually have tables lined up with the different breed types organized together. Each fleece will be in a clear plastic bag and have a tag with the details and pricing. Think about what breeds and colors you like before you go inside so that you don’t get overwhelmed. If you are not sure you can ask a staff member to help you. They will likely ask you if you have a specific project in mind to help you narrow down choices. Some good "beginner" fleeces are breeds like Romney, Bluefaced Leicester, Jacob, Shetland, and Finn. There are plenty of other good ones, but these come to mind when thinking about easy scouring and fiber preparation. If there is a skirting table available, you can ask to see the fleece taken out of the bag. A staff member will unroll the fleece on the table and allow you to inspect it. Some festivals do not have the space or staff for this, so you will have to look at in inside the bag only. Most fleeces are rolled up in their entirety with the cut side facing out and frequently the dirtier parts are at the bottom of the bag (that's where I always look). You will want to check for fineness, lock structure, and staple length, strength, the amount of vegetable matter (VM), and overall quality. Take care when digging around to not pull the fleece apart as people like it intact when buying. Also, when you are done, please do try to put things back where you found them to make it easier on other patrons who are shopping. After you have made your selection and purchased your fleece (congrats!) be prepared to take it with you as most events do not have room for storing purchased fleeces and they can weigh several pounds each. It's a good idea to make arrangements ahead of time where to stash your bags while you continue to shop at the fair. Mornings on the first day are usually busiest and have lines to get in to fleece sales, but you can usually find good quality ones later on if you wait to avoid crowds. There are several sources for buying online such as Etsy and Facebook groups. When buying online, make sure to use a payment with buyer protection such as PayPal. The seller should furnish the breed, overall quality, price/lb., total weight and price, amount of vegetable matter (VM) and skirting, staple length, estimated shipping, and accurate photos. Do not buy a fleece that has heavy VM, kemp, scurf, lice (more common in mohair), lots of second cuts, breaks / weak spots, has a short staple length, or is not skirted at all. Bargain fleeces take more time than they are worth, so I wouldn't bother. It's OK to ask how much VM there is and how heavily skirted the fleece is. Check the seller’s return policy and reputation before purchasing. Although I have many friends who are growers, and I respect the amount of work and care they put into their farms, sometimes online transactions don’t go as planned. Some growers are not handspinners or don't understand the difference between fleece that's best sent to a mill vs. hand processed. Most of it has to do with communication and fiber education (or lack thereof). You should expect to receive your purchase in a timely manner and for the appearance and weight quoted. Open the package immediately because wool absorbs moisture and anything packed in plastic can mildew quickly. It can also felt in the bag where there is humidity, heat, and getting jostled around in transit (this also goes for roving or any loose wool fiber). Inspect the fleece and remove any undesirables before storing. Because wool absorbs moisture, it can vary a bit from the shipped weight but if you notice a huge difference, let the seller know. Check the weight using a postal scale and write down the seller, breed, weight, and price paid for future reference and keep it with the fleece. I always quarantine raw fleece to make sure I don’t bring any moths inside and try to wash it as soon as possible. If you have any questions or concerns, contact the seller directly and provide a description of the issue and photos if necessary. Keep original packaging in case you need to file a claim. If you have a bad experience, don't give up! Just take a note of the issue so you can avoid it in the future. In my years of buying fleece and fiber you can expect a few duds, but it's very rewarding to process fiber by hand and a great way to learn about wool and different breeds. Try to get the best fleece for your budget, but only spend only what you are comfortable with. Fleeces can be relatively expensive because the cost of feeding and caring for the animal while it grows the precious wool is not insignificant. The value comes from knowing the source of your raw materials and supporting small local businesses. If you budget ahead of time and do your homework you will make a good choice. How much will you pay? First, look at “comps” for other similar fleece either online, at a fleece sale, or ask someone with experience. There's a wide range from $25-$350 depending on type of animal, breed, size, quality, cleanliness, scarcity, and locality. 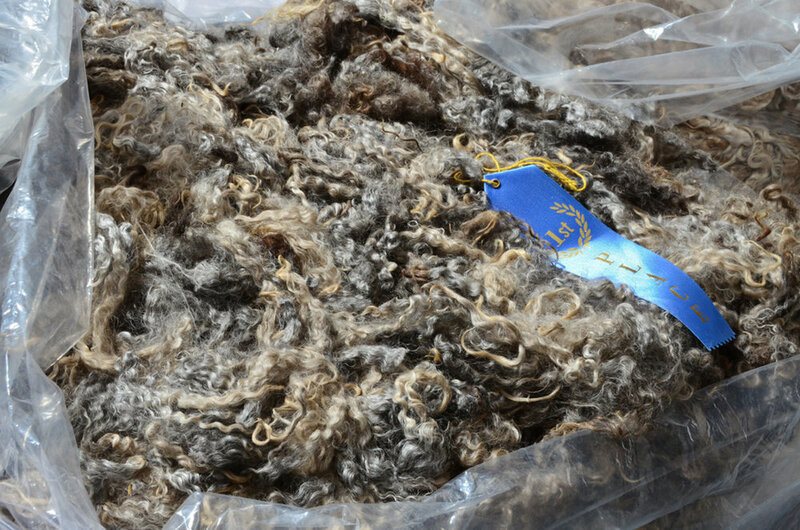 Most raw handspinning fleece is priced per pound and sold as an entire fleece. Sometimes you can split a fleece with another buyer. If you have a shopping buddy you can ask them, or if buying online you can ask if the seller will split it. Not all sellers will, but it doesn’t hurt to ask. I've split fleeces before, and it's a great way to sample without going all in. How much fleece do you need/want? Fleece sizes can vary greatly. You can expect to lose around 20-30% of the raw weight after washing and some some fine / greasy fleeces can lose more than half, so you will likely have far less yield than you started with. If you have a specific project in mind, think about the desired finished weight and add 10% on top of that to your yield after washing. 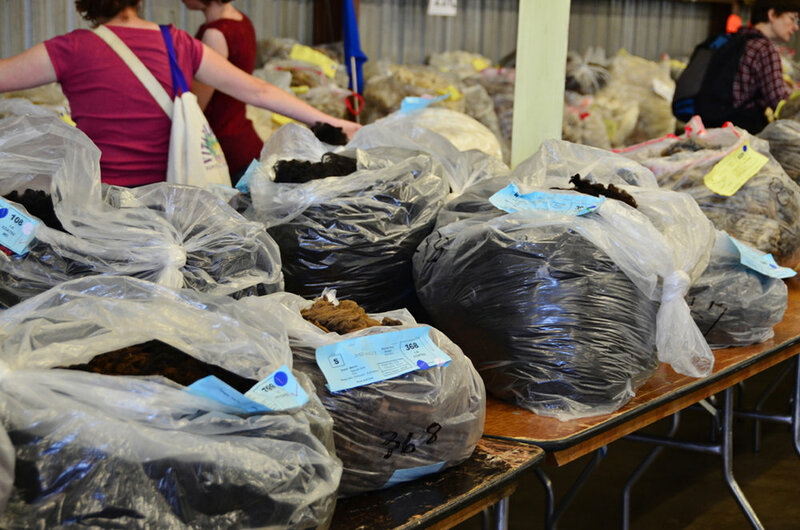 Raw fleece is just that - it has been sheared off the animal, rolled up as a whole, and put in a bag. Wool will have grease, dirt, vegetable matter (VM), and sometimes insects and unidentified gunk in it. Most show fleeces have been lightly skirted, which is the process of removing any dung tags, heavily soiled areas, or second cuts. When you get home, you will need to unroll it outside to pick through it and then scour it with wool-specific detergent like Unicorn Power Scour. If it’s your first time washing raw fleece, I highly recommend starting with a medium to long wool breed with a limited amount of grease. It’s very easy to felt fine, greasy fleece, so wait until you’ve had some practice before jumping in. Follow the directions and wash only small amounts at a time (8 oz or less). Pick a good detergent - do not use soap, bleach, oxy-clean, shampoo, hair conditioner, or any other cleaning agents that do not have the correct pH to remove dirt safely without damaging the fiber. What impacts the price of a fleece? Breed Characteristics: Some breeds cost more in general due to fineness, scarcity, and handspinning desirability. They can have a particular lock structure, crimpiness, and color definition that buyers look for. Sometimes a cross (X) (where the parents are different breeds) will give you the best characteristics of both. Fineness: The finer the fleece (low micron count), the more desirable and higher the price. Usually the first clip, or shearing, will yield the softest fiber. Some animals like goats grow much coarser fiber as they age, so it’s best to buy the baby or young adult fleece. Lamb fleece can be identified by it's characteristic curly-Q lock tips. Fiber under ~ 25 microns (diameter of the fiber staple) is going to be next-to-skin soft and great for lots of projects like scarves and cowls. Upwards of 28 microns and it starts to be itchy and comfortable. Higher micron count fiber like longwools are generally durable and excellent when used for outerwear and rugs. Staple Length: You want to make sure that there is adequate length for spinning (about 2.5+ inches minimum). Even if you blend a shorter staple fiber with a longer one you may get fraying and pills in your yarn. Strength/Soundness: Avoid buying fleece with any breaks or weak spots. You can test this by firmly grasping both ends of a lock of fiber and quickly tugging on it while holding it next to your ear. If you hear a nice ping / twang and no breaking it’s fine. Cleanliness: Covered (jacketed or blanketed) fleece will fetch a higher price. The sheep have had their fleece covered to reduce the amount of VM and UV exposure. Some breeds do not do well with blankets, so if uncovered, check the amount of VM and avoid heavily soiled fleece that will be difficult and time consuming to process. Fine wools are notorious for holding onto bits of VM like velcro, so I tend to only buy coated Merino to reduce fiber loss and processing effort. You're just going to have to comb some fine fleeces to get the VM out. It won't come out in carding (despite what some people claim) and will be a pain when spinning as you have to stop and pick out the VM constantly. Color: This depends on what is desirable for the particular breed and if you want to dye it. Because raw fleece carries a lot of grease and dirt, expect for it to look lighter when washed. Some fleece that is very greasy can look dingy then become optic white when washed. Try to look at the cut end for a clue to how it will wash up. Here are some prices I have seen or paid for different types of fleece. This is just my own experience and only meant to give you a general idea. Prices vary quite a bit by grower, locality, and demand. I am the Washington DC metro area and I have seen prices vary quite a bit between different festivals and seasons. You can print this list to take with you when shopping. Good luck and may the fleece be with you!